Announcement Welcome to Rooster Studios where you'll find a wide selection of gifts that are guaranteed to impress anyone. Free gift-wrapping and shipping. Custom and wholesale orders are welcome. Welcome to Rooster Studios where you'll find a wide selection of gifts that are guaranteed to impress anyone. Free gift-wrapping and shipping. Custom and wholesale orders are welcome. Four new serving boards. They are simply amazing. 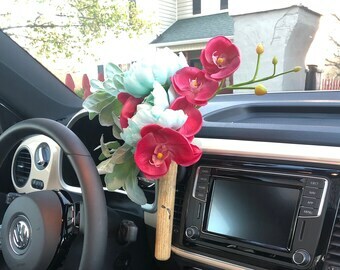 For all VW owners, look how one of my uses her bud vases. A client sent me this photo of her bud vases. She loves them. Working on a black walnut bowl. 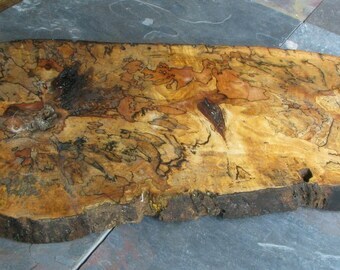 Soon to be a spalted maple pepper mill. Black walnut rolling pin anyone? "It is about recognizing beauty in a piece of wood that at the moment isn’t beautiful." I've always been an artist. I started as a primitive painter and then dabbled in mosaics, clay, textile design, stained glass and finally wood. I'm self-taught: no fancy art degree or mentor. 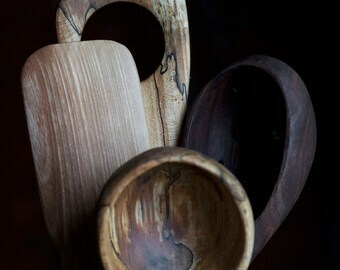 I began my woodworking career making log containers for rustic wedding centerpieces, but soon grew bored and began making housewares and kitchen utensils. I sell to the gift market because I love making gifts for people to give to someone special. I hope the person who receives one of my pieces loves it, and I hope that the person who gave my piece is happy because they gave a gift that the person loved. I take discarded wood that no one cares about and is decaying and ugly and turn it into something that someone will use every day and love. I don’t make bowls that sit on shelves to be beautiful. I make functional items that I hope become heirlooms. I see beauty in things that are not yet beautiful. One of my favorite items is the set of appetizer plates. I was inspired by my Grandmother's friendship tea set. Each tea set (a cup, saucer, and plate) came from a different country. When she hosted a tea party, each woman would turn their cup/plate over to see where it was made. It was a way for women to meet each other and become friends. I think that my appetizer plates do the same thing. I write the name of each wood on the bottom of each plates as a conversation starter.